LAKE SUCCESS, N.Y.--(BUSINESS WIRE)--Aug. 24, 2006--Canon's EOS Digital Rebel XT model - the camera that set all time sales records for digital SLRs of any persuasion (supplanting the original Digital Rebel's claim to that title) - now takes its place alongside of the newest member of the irrepressible Rebel clan: the 10.1 megapixel EOS Digital Rebel XTi SLR camera. For 16 years, the Rebel brand has stood for advanced, sophisticated and easy-to-use. The new Canon EOS Digital Rebel XTi camera continues that legacy, taking discriminating photo hobbyists, enthusiasts, advanced amateurs and SLR aficionados to places digital dreams are made of ... and more economically than ever before. "The EOS Digital Rebel XTi camera continues to lead the way with impressive innovations and an array of advancements simply not found on other digital SLRs in the sub-$1,000 price-range," stated Yukiaki Hashimoto, senior vice president and general manager of the consumer imaging group at Canon USA, Inc. "Canon technology is born of inspiration, imagination and our passion to help photographers make the best pictures possible. 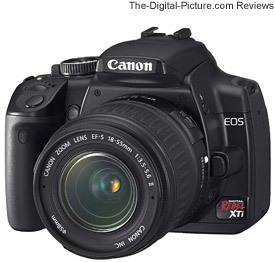 Nowhere is the combination of undeniable quality and value more evident than on this new EOS Digital Rebel XTi camera." In stores mid-September, the EOS Digital Rebel XTi camera is offered in both sleek brushed silver patina and "pro" matte black finishes. It is available in two kit configurations: with and without Canon's high quality EF-S 18-55 mm f/3.5-5.6 zoom lens. The EOS Digital Rebel XTi camera will be available for an estimated selling price $899* with the zoom lens kit, while the body only kit will carry an estimated selling price of $799*. In order to maintain an appropriate pricing structure, the Digital Rebel XT model will carry an adjusted estimated selling price of $799* with the zoom lens kit and $699* for the body only kit. No mere intermediate upgrade, this new EOS Digital Rebel XTi SLR continues Canon's combination of imaging excellence, intuitive ease of use and affordability. Indeed the EOS XTi Digital SLR camera now leads the Digital Rebel revolution with such marquee features as its higher 10.1 megapixel resolution; refined and redesigned Canon CMOS sensor; larger, easier to read 2.5 inch display screen (along with simplified and streamlined menu navigation), and the remarkable EOS Integrated Cleaning System, a self-cleaning image sensor unit/dust removal system that is available on no other camera of any make, at any price. Despite the addition of these and other imaging improvements - including Canon's fast, high-precision 9-point autofocus system and a new maximum burst rate in large/fine and raw quality modes that - at three frames per second - is double the capability of the Digital Rebel XT SLR, The EOS Digital Rebel XTi SLR makes its debut at a price point that is $100 less than its top-selling sibling was at its introduction and hundreds of dollars less than other SLR cameras and camera kits in its class. At the heart of the Rebel XTi SLR's high-resolution image capability is its large, single plate, CMOS color image sensor. Designed and manufactured by Canon specifically for the Rebel XTi SLR, this highly responsive sensor's 10.1 million pixels are fractionally smaller than the pixels in the 8 megapixel Rebel XT model, yet deliver markedly improved resolution, enabling the sensor to capture more image information. This results not simply in the ability to generate larger images, but also permits details from cropped images to be rendered with higher image quality than cropped images from lower resolution sensors. At 22.2 x 14.8 mm in size, this new CMOS sensor maintains the 1.6x conversion ratio found on many other members of the EOS Digital SLR line including the Rebel XT and the EOS 30D models. Inherently more efficient than CCD type image sensors, Canon CMOS sensors significantly reduce image noise levels by converting light values to electrical signals on the chip rather than having them converted elsewhere in the camera. The Rebel XTi SLR's CMOS sensor goes further still, maintaining an exceptional dynamic range while reducing the noise level that one might typically expect for a pixel size delivering such high resolution. Canon engineers and designers achieved this breakthrough in sensor design by reducing the space between the chip's microlenses while at the same time increasing the sensitivity of each photodiode. As a result, the camera achieves 20 percent greater resolution than an eight-megapixel sensor with comparable noise reduction and dynamic range. The Digital Rebel XTi SLR also continues the long-standing tradition of featuring a wide range of ISO settings (100 -1600) with the ability to "float" to any intermediate step along that range in fully automatic modes while allowing the user to set the ISO manually at full step intervals in the camera's creative modes. Beautiful, high-res images marred by the presence of ugly high-res dust spots can be cause for painstaking, time consuming photo retouching (with varying degrees of success). Canon takes the quest for imaging excellence and easier camera maintenance a unified giant step forward with its new, two-tiered dust removal technology called the EOS Integrated Cleaning System, available only on the EOS Rebel XTi camera. While real world shooting rarely achieves "clean-room" standards, Canon has gone out of its way to design the XTi model to first create or attract no dust. Canon begins by minimizing the dust and particles created by the camera itself, by reformulating the materials used in the body cap and shutter to materials more resistant to particle "fall out" due to normal use and wear. Canon also treats the camera's low pass filter with an anti-static charge to prevent static-charged dust from adhering to it. Still, recognizing that humidity and a variety of real world conditions can cause dust to enter and adhere to the sensor or low pass filter despite the most scrupulous of efforts, Canon created the Self Cleaning Sensor Unit. The low pass filter on the front of the CMOS sensor is attached to an ultrasonic vibrating unit that literally shakes the loose dust particles off of the surface. The newly liberated dust is then captured by an adhesive material that keeps the particles from becoming airborne again once the camera moves. The self cleaning sensor unit's ultrasonic anti-dust shake activates automatically for one second whenever the camera is powered on or off, ensuring that the camera will be as relatively dust free as possible and can be activated at other times through a simple menu selection. Despite the ingenuity behind the Self Cleaning Sensor Unit there are occasions when dust particles of a stickier nature are not vibrated free of the low pass filter. In these situations, the Dust Delete Data function can be engaged. Simply put, by aiming the camera at a white wall or even a white piece of paper (or, in a pinch, removing the lens from the camera) the Dust Delete Data function will map the size and position of the dust particles remaining on the low pass filter. Once the dust is "mapped", that information is attached as metadata to all subsequently shot images regardless of recording format, RAW or JPEG. When the images and appended dust data map are transferred to a computer using the Rebel XTi's new Digital Photo Professional software, the dust information can be subtracted from the images simply by selecting the "apply dust delete data" option. Users can update the Dust Delete Data at any time via controls found in the Rebel XTi's LCD menu. Among the decidedly user-friendly enhancements built in to the new Digital Rebel XTi is the 2.5 inch, 230,000 pixel color TFT LCD monitor with its wide, 160 degree viewing angle. The envy of the EOS digital SLR line, this new screen features a viewing area that is nearly twice as large as the Rebel XT model's 1.8-inch monitor, and offers six brightness settings for easy viewing of images and menu options in a wide range of lighting conditions. Indeed, this brilliant monitor is approximately 40% brighter at its maximum setting than screens found on the top-tier EOS-1D Mark II N, EOS 5D and EOS 30D digital SLRs. The monitor is also the new home for all camera settings information. This was previously housed on a separate LCD. This new configuration allows for more information and larger font & icons in one easy-to-view area. The monitor is even intuitive enough to automatically (and temporarily) turn the display off when the camera is raised up to the user's eye. This feature not only saves valuable battery life but also avoid subjecting the user to distracting screen brightness when looking through the viewfinder. For maximum battery life, the LCD display can be shut off manually as well. In keeping with this new, bigger, brighter monitor is the Rebel XTi SLR's redesigned menu, made bolder, easier to read and easier to navigate. Notable among the expanded info screen menu features offered for the first time on a Digital Rebel camera are the RGB histogram and the Picture Style functions first introduced on the Canon EOS-1D Mark II N, EOS 5D cameras and most recently added to the EOS 30D's imaging arsenal. With Picture Style, users can more easily select presets for sharpening, contrast, saturation, and color tone that most closely reflect their needs and intent for a particular picture. Similar to selecting the film type in order to achieve a desired result, the Picture Style feature offers six setting choices--Standard, Portrait, Landscape, Neutral, Faithful and Monochrome -- with an additional three user defined settings available. Also migrating to the Rebel XTi camera from the upper reaches of the EOS Digital SLR line is Canon's flexible folder management system with capability to store 9,999 images in a folder as well as manual creation of new folders and perhaps most importantly, the same high precision 9-point Autofocus sensor and AF unit found on the EOS 30D SLR. Like its Digital Rebel predecessors, the EOS Digital Rebel XTi camera is equipped with Canon's standard EOS EF lens mount making it compatible with Canon's complete line of EF lenses as well as the EF-S line of lenses created specifically for the EOS 20D, and EOS 30D prosumer digital SLRs, and the EOS Digital Rebel models. While the Digital Rebel XTi offers the same fast 3 frames per second as the Digital Rebel XT model, the burst rate in Large/Fine JPEG and Raw settings has nearly doubled, from 14 eight- megapixel JPEG images and five eight- megapixel RAW images on the Rebel XT model to 27 10.1 megapixel JPEGS and ten 10.1 megapixel RAW images on the new Rebel XTi camera. Purchasers of the EOS Digital Rebel XTi camera or any of Canon's digital SLRs are never faced with extra-cost software to make the camera perform to its full capabilities. Rather, Canon continues its long-standing tradition of including "in the box", a comprehensive software bundle that includes both the camera's utility programs and Canon's Digital Photo Professional software (presently in version 2.2). Compatible with both Mac OS X and Windows XP operating systems** formats, the Digital Photo Pro software assists users with everything from image transfer and viewing, image enhancement and editing, RGB image editing functions, image noise reduction, viewing, processing and editing of RAW images, Direct Print functions and Canon's groundbreaking new Dust Delete Data functions. The EOS Digital Rebel XTi camera maintains the top-tier technologies that have helped power the EOS line of digital SLRs to the forefront of the industry and the marketplace. These include Canon's power efficient DIGIC II Image Processor and E-TTL II, Canon's evaluative-through the lens exposure control that ensures optimal exposure even in difficult lighting conditions. *Pricing subject to change at any time. Actual prices are determined by individual dealers and may vary. ** System requirements are available at http://www.usa.canon.com.